Hello, and welcome to Uptown Dallas! If you are interested in moving to Uptown, one of the reasons is probably that Uptown Dallas is a great place to meet a lot of professionals! If you are thinking of where in Uptown to locate, keep in mind that some apartments are better than others to meet people, depending on several factors. I’m going to give you my thoughts on what I think are Four Top Uptown Dallas Apartments to Meet People. We will be looking at factors that make it easier to meet people, like closeness to attractions, building structure, age of building, planned parties, and more. Katy Trail Dallas – The unique almost 4 mile Katy Trail Dallas that runs throughout Uptown Dallas is terrific for getting exercise…it’s also pet friendly. It has several access points throughout Uptown, including public access points and private access points that connect with certain apartments. Make no mistake, the Katy Trail is wide and great for running, biking and more. And, it’s known as a great way to meet people. PATIOS a Plenty – I’m not sure if I have ever seen as many outdoor patios in any one place as in Uptown. Just about every restaurant has a decent size or larger patio. It’s a great way to people watch and also makes it easier to recognize and say hi to someone new. 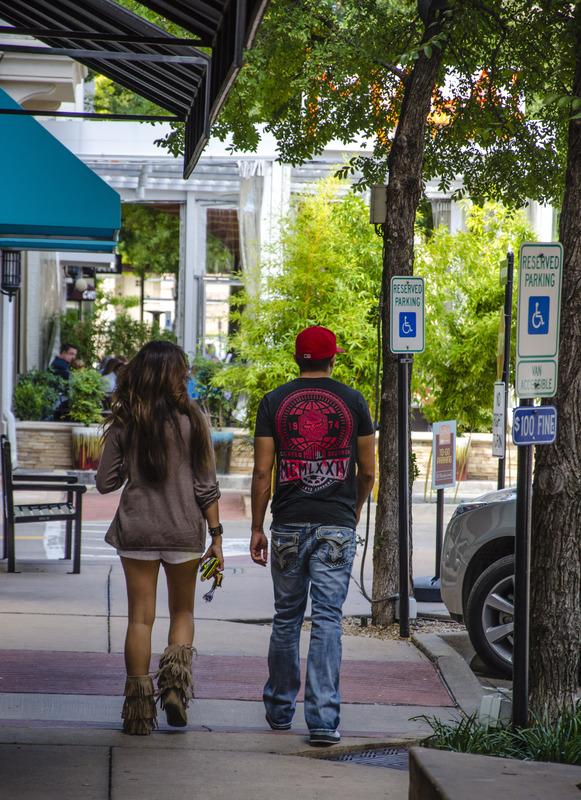 Walkability Leads to Interaction – Uptown Dallas is extremely walkable…that’s the mantra here. If you can quickly walk to an attraction in 7 minutes or less, it’s going to be more convenient and frequented. Most of Uptown Dallas can either be walked to or you can hop on the free Uptown Dallas trolley to get to it. A walkable lifestyle leads to more enjoyment and much more interaction as well. Lots of Events – There are a lot of events that are meant specifically for Uptown Dallas residents. That includes the Katy Trail 5K run, the Crawl for Cancer, Celebrate Uptown and more. There are events during the key summer months, but also events in the winter months too. These are terrific events to meet a large number of Uptown residents. Dog Friendly Venues – Uptown Dallas residents like their dogs! Over 100 restaurants in Uptown Dallas have pet friendly features. And, here’s a hint: Statistics have proven that more people will talk to you if you have a dog. These are only some of the key social features of the Uptown Dallas area. There are also some apartment specific features that will help you socialize as well. So, let’s explore some of the apartment specific features that also help with meeting people! Location of the Apartment– The apartment location within Uptown Dallas is perhaps the number one feature to look for. What are the best things to be close to? Many people want to enjoy the great night clubs of Uptown Dallas, but those are pretty much just for weekend nights. However, the best way to meet people is to be close to the features and attractions that people go to during day to day living, not just at night. That would include places you can get lunch at, shop at, work out at, buy groceries, at, etc. Being close to features like the West Village shopping center and the Katy Trail, as well as the grocery stores in Uptown, makes that easier. (Two key grocery stores are found in the West Village area – Kroger’s Signature Store and Albertsons). You can always catch a trolley to go to a night club…but for most of the other days in the week, it’s better to live near day to day features. Close to the Uptown Trolley – The Uptown Trolley is free, and there are key stops throughout Uptown Dallas on McKinney Avenue. Being close to an Uptown Trolley stop is important to make it convenient to go to attractions to meet people. Mid Rise Design – The more modern mid-rise design is the best overall design apartments can have if you want to meet the most people. That’s because people tend to use common areas in one building for their daily activities, like getting mail, getting coffee/water, elevator, parking, etc. It’s just much easier and more convenient for meeting people vs. the older, traditional “spread out” apartments of the 1990s, with multiple buildings, etc. Well Attended Regular Social Event – Almost every apartment in Uptown Dallas has a regular social event to meet other residents. But some of these are better…and more well attended…than others! The location of the event is important. I look for events that are held outside the apartment at a venue in Uptown Dallas, such as a restaurant or night club…those are more well-attended than the ones held in the club house of an apartment. The frequency of events – Some apartments have a monthly event, while others have a less frequent event. Multiple Community Events – Many of the apartments in Uptown Dallas are owned by a handful of management companies. So, there are “sister” apartments throughout Uptown Dallas that combine resources to have multiple community events. These are the ones I prefer because they usually have more people. These are just some of the main features I look for in Uptown Dallas apartments to make it easier for our clients to meet people. AMLI Quadrangle – The AMLI Quadrangle is also located in a bit quieter area of Uptown Dallas, but with quick walking distance to several key attractions of Uptown, including McKinney Avenue and the free Uptown Trolley. The AMLI uses the Mid-Rise design nicely, to also provide common areas to meet people (garages, mailboxes, etc.). The interior pool is large, beautiful and just fun looking, with fountains spraying water all around. Overall location, plus the very attractive amenities, make it easy to meet people here. Recommended. Monterey by Windsor – The Monterey by Windsor is one of the best places to be if you want to meet people. The Mid-rise design gives you a lot of common areas (mailbox, garage, pool, etc) to easily connect with other people. The pool is one of my favorites in Uptown. In addition, the location keeps you within quick walking distance to the Katy Trail, the West Village and 2 grocery stores in Uptown Dallas. But, even better, the Monterey “gets it” that it’s important to provide opportunities to meet people. Their events are typically out in Uptown, and they combine 3 other sister communities, giving you a lot of people you can meet. L2 Uptown – The L2 location is near several key attractions of Uptown, including a great block of restaurants on McKinney Avenue, Mutt’s Pet Park, the Rustic for live music and some other quick walking restaurants off McKinney as well. The Mid-Rise design gives shared amenities with common entrances, including the garage and mailbox. The gym is perhaps the best in all of Uptown apartments, with 2 stories of equipment, a spin room, a yoga room and more. (Gym features like these make it extremely desirable and easy to meet people.) The pool areas combine to give what might be the largest amount of interior pool space in Uptown, with an amazing amount of chairs and tables to enjoy. Monaco on the Trail – The Monaco on the Trail Mid-Rise was completed in 2013. If you looked at it outside, it would seem like it is in a (too) quiet area of Uptown Dallas. But, don’t let this quick look fool you. It’s just about 3 minutes away WALKING DISTANCE from the busy social scene of the West Village, and also 3 minutes away from catching the free Uptown Trolley anywhere in Uptown. What I also like about the Monaco is that their social events are not centered just around nightclubs, but they are centered around getting in shape. And, of course, their location is literally right on the Katy Trail Dallas, making it easy to get a quick run in anytime…and meet up with others on the Trail too. One of my new favorite apartments has many of the key features I mention above as important, but is better if you want to meet quality people without needing the party scene. It’s called the Gallery at Turtle Creek, completed in 2014, also a multi-story Mid-Rise. I love the high amount of glass in the design, creating light and bright apartments. But, for meeting people, this apartment is also terrific. It has a 2 story gym with an incredible amount of features. It also has the common areas (mailbox area, garage) that help in meeting people. It also has an unusual terrace deck outside of the gym, a terrific place to wind down and enjoy the day with others. I like the great people that this is attracting, and I would recommend taking a look at this apartment for a safe and excellent place to start your social life in Uptown Dallas. Ready to Live in Uptown Dallas? There are plenty of other terrific Uptown Dallas apartments that are great to meet people, but for time sake, I wanted to point out some of the best in general. Uptown101 provides you with detailed information about apartments here in the area that have the social features that will help make it easier for you to meet new people. Come talk to us and let us help you determine your perfect area and particular residence in Uptown Dallas. Katy Trail in Uptown Dallas is a beautiful area of Uptown Dallas. Uptown Dallas – Staying in Shape in And Mingle While You Do It!